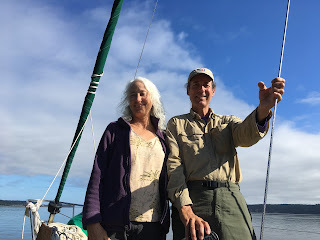 How wistfully we read the blog posts of our old cruising friends, those still making passages on their sailboats up and down the Gulfo de California in sunny Mexico. They anchor in sandy bays and wake up to bright warm light streaming into their cabin. Up here it is a struggle for survival with the constant drizzle, overcast skies, and just above freezing temperatures. We've had to wear socks! There was a rare week long period when it didn't rain. That's when we repaired, sanded, and painted Traveler's bottom. Since then, we've not had enough "no rain" days to do any exterior work on Traveler and it looks like this trend will continue another month. We've contracted with a local mechanic to replace our propeller shaft and coupling but I think he's hiding out from the rain as well as the only progress I have seen is the absence of our propeller. On the home front, things are moving more rapidly. I made the mistake of check-marking the little box in the website Zillow that announces that for a certain price, a buyer could "make us move." Some folks from American Samoa, 7000 miles away, saw that little checked box and made us an offer. We were not ready to move and were actually looking forward to having a little hibernation time in Connie's Tumwater house. Now we are immersed in all the pesky details of negotiating the sale of this little house. We are doing so without the guidance and cost of agents, saving a chunk of change in the process. Can I tell you how unpleasant it is to put on the overalls and squirm under the house into the crawl space. How about the fun to be had picking up rat poop and replacing soiled insulation in the attic? Paperwork comes flying in attached to email messages. We print it off then fall asleep trying to read the legalese. Sign, initial, date. Scan it and send it off. Google the phrase "time of transfer", "encroachment", and "statutory warranty deed". Heck, I just recently figured out the difference between port and starboard. The good part about this sale is that we'll be able to continue to stay here for a little while as renters. That will give us all of spring to look for another place to land while we try to get boat projects done to be ready for chartering season in June. We've got our LLC started and have started taking reservations for cruises this summer. Anyone reading this blog is probably a friend or family so I'd like to make you a special offer. We are having a "Friends and Family" special for bookings in May and June. It's a half price sale. Book a cruise, or buy a gift certificate for a cruise (give it as a gift) and we'll slash the price in half. How's that for raw capitalism? Meanwhile, Connie has had a gig here and there. We are still freaking out at what's happening to our country and what's happening to our planet. Both of us are relatively healthy. Connie's kids are doing great. We are enjoying the friendships that abound her in Olympia and miss the folks in Seattle that we used to hang with there. As I lie in bed, I do continue to dream of those southern seas and the bright warm light streaming into our cabin. Miss those days, yes. Connie got a tea cozy for her birthday.